Ashlyn Kelly and Ursula Rodriguez were just wrapping up a tour of Grand Canyon University’s nursing school in Sun City on Thursday when a prospective student asked a good question: What was the most important thing she needed to know about learning to become a nurse? 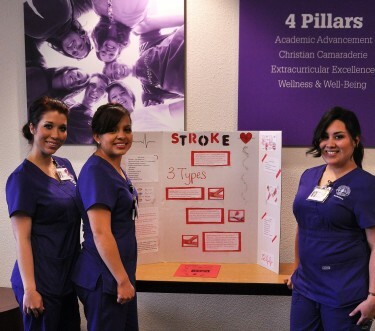 GCU nursing students (from left) Kristine Avena, Mayte Osuna and Jessica Dear presented information about stroke at the Banner Boswell open house. Kelly and Rodriguez were among dozens of GCU students in the College of Nursing and Health Care Professions, along with faculty and staff, who showcased the 21,000-square-foot Banner Boswell facility during an open house and heart-health fair. The event, attended by about 125 people, included free blood pressure screenings, tours of a state-of-the-art skills lab and simulation center, and remarks by Dean Anne McNamara and site director Dr. Roni Collazo. The community event was the first of two scheduled this spring by CONHCP, which will host an open house at its Scottsdale Healthcare Shea campus, 9201 E. Mountain View Road, Suite 100, from 4 to 6 p.m. Wednesday. Tours of the facility, including the Antelope Reception Center where enrollment counselors meet with potential students, are planned. On Thursday, McNamara talked about the difference between GCU’s nursing program and others, most notably that students have the opportunity to learn how their world views and beliefs impact their careers. Located across the street from Banner Boswell Medical Center, and in partnership with Banner Health, the site is the seventh cohort in CONHCP. It currently has about 80 students in the pre-licensure cohort. Volunteer Emmy Poe, 84, drives there each week from her home in Sun City to let students practice their skills on her. On Thursday, they gave her a neurological exam, and last week Poe’s ears, eyes, nose and throat were examined. They are, said Assistant Professor Amy Johnson, noting that volunteers enable students to sharpen their medical knowledge and communication skills. Recently, the students noticed a heart murmur in a volunteer and asked one of the faculty members to confirm it. The man was then referred to his physician. As a result of the students’ finding, the man had surgery to repair his heart. “They are willing to let us poke and prod and assess them, and the feedback they give students is fantastic,” Johnson said. Thursday’s open house gave students opportunities to develop heart-related presentations and discuss them with the general public. Jessica Dear, Mayte Osuna and Kristine Avena researched stroke issues, prepared a flyer on its causes, treatment and prevention, and encouraged visitors to obtain a Spot a Stroke F.A.S.T., a new free app. 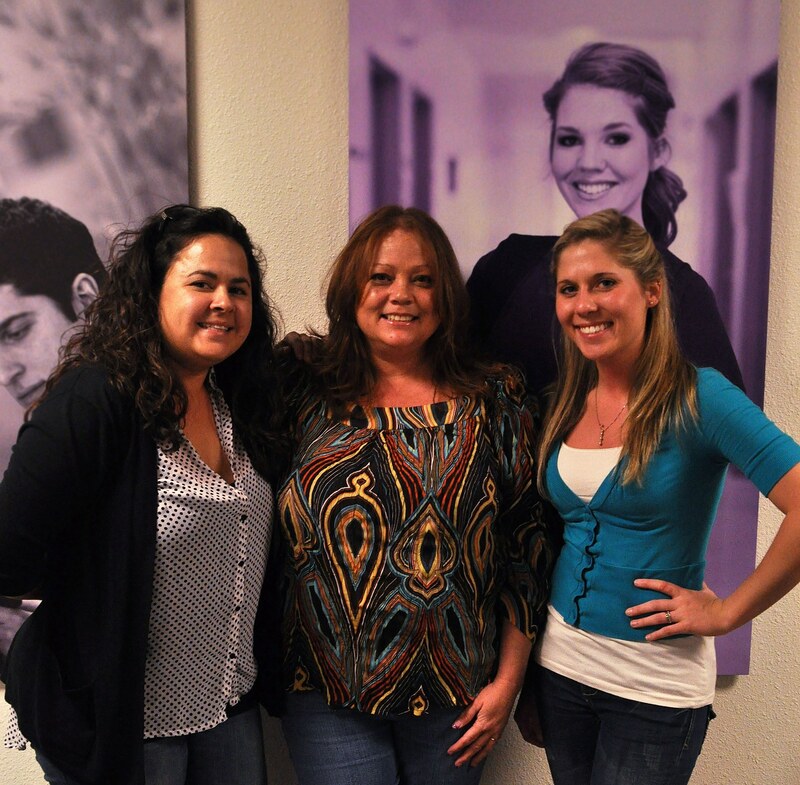 New GCU students (from left) Leni Day, Alicia Webb and Jessica Hickok start classes in May. The students’ presentations gave three new students, Jessica Hickok of Surprise and Leni Day and Alicia Webb of Phoenix, the chance to see what nursing school is like. Day and Webb met Hickok at the open house, and by its end they had become friends and asked to be placed in the same classes. All three came to nursing because of experiences they’ve had caring for family members, and each had researched other schools, including Arizona State University, before choosing GCU.